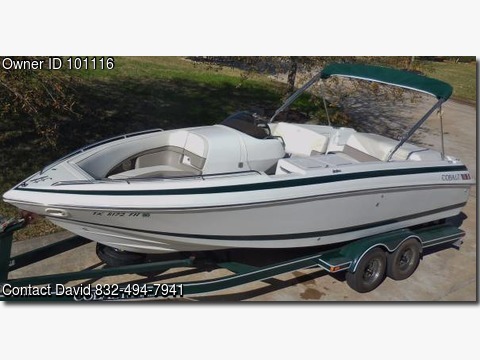 Boat is located in Conroe,Texas.Please contact the owner @ 832-494-7941...This Cobalt 25LS is an open bow Sun-Decker style luxury power boat with a 7.4L, 310-HP Volvo-Penta with Duo-Prop and 73 gal fuel tank. Accommodations include: Bimini top, 4 speaker stereo AM/FM/CD/Bluetooth/USB, two sinks with faucet, storage cabinets under sink, bow dinette table, transom shower, head compartment with porta-potty, and two ice chests. Details: Accommodations: Seating for 12, Bimini Top, Bimini Canvas Enclosure, Transom Shower, Head Compartment w/porta-potty, Bow Cushion Insert, Removable Carpet, Built-in Ice Chest for Fish, Igloo Marine Ice Chest under Captains Chair, Air Compressor/Inflator, and Walk-Thru Transom w/Door Galley Equip: Two Sinks with Faucet and under-sink storage cabinet with Trash Receptacle and Bow Dinette Table. Electronic Systems: Depth Gauge, Trim, Speed, Tach, 4 Speaker AM/FM/CD/USB/Bluetooth Stereo Deck & Hull Equipment: Deck Lights, Instrument Lights, Docking Lights, Double Wide Helm Seat, Tilt Steering, Anchor Locker, Bow Skuff Plate, Concealed Boarding Ladder, Fender Storage, Midship Cleats, Cockpit Refreshment Console, Self-Baling Fiberglass Cockpit Liner Additional Equipment: Full Canvas Boat Cover, Dual Battery Switch, Ignition Safety Switch, Accessory Power Plug, Tool Kit, & Engine Hour Meter. The Cobalt 25LS is nothing if not adaptable. A rare combination of luxury, performance, and recreational opportunity, the 25LS can be as relaxing or as exhilarating as you want. It's the perfect setting for swimming, skiing, fishing, diving, leisurely cruising, or impromptu water wars. Few boats can match the 25LS's effortless blend of agility, power, and stability. Here's a boat for families. Restful, comfortable, but ready to make a major splash at a moments notice.